14Nevertheless, I have a few things against you: There are some among you who hold to the teaching of Balaam, who taught Balak to entice the Israelites to sin so that they ate food sacrificed to idols and committed sexual immorality. 15Likewise, you also have those who hold to the teaching of the Nicolaitans.16Repent therefore! Otherwise, I will soon come to you and will fight against them with the sword of my mouth. 17Whoever has ears, let them hear what the Spirit says to the churches. To the one who is victorious, I will give some of the hidden manna. I will also give that person a white stone with a new name written on it, known only to the one who receives it. This article is about the ancient Greek city. 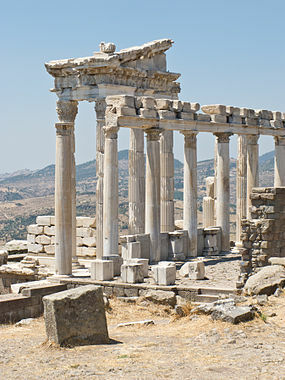 For the nearby modern city of Turkey, see Bergama. For some mythological and Bible uses, see Pergamus. .
Xenophon provides the earliest surviving documentary mention of Pergamon. Captured by Xenophon in 399 and immediately recaptured by the Persians, it was severely punished in 362 after a revolt. It did not become important until Lysimachus, King of Thrace, took possession, 301 BC, but soon after his lieutenant Philetaerus enlarged the town, the Kingdom of Thrace collapsed and it became the capital of the new kingdom of Pergamon which Philetaerus founded in 281, beginning the Attalid dynasty. In 261 he bequeathed his possessions to his nephew Eumenes I (263-241 BC), who increased them greatly, leaving as heir his cousin Attalus I (241-197 BC). The Attalids became some of the most loyal supporters of Rome in the Hellenistic world. Under Attalus I (241–197 BC), they allied with Rome against Philip V of Macedon, during the first and second Macedonian Wars, and again under Eumenes II (197–158 BC), against Perseus of Macedon, during the Third Macedonian War. For their support against the Seleucids, theAttalids were rewarded with all the former Seleucid domains in Asia Minor. As a consequence of its rise to power, the city expanded greatly. Until 188 BC, it had not grown significantly since its founding by Philetaerus, and covered circa 21 hectares (52 acres). After this year, a massive new city wall was constructed, 4 kilometres (2.5 mi) long and enclosing an area of approximately 90 hectares (220 acres). Not everyone in Pergamon accepted Rome's rule. Aristonicus, who claimed to be Attalus' brother as well as the son of Eumenes II, an earlier king, led a revolt among the lower classes with the help of Blossius. The revolt was put down in 129 BC, and Pergamon was divided among Rome, Pontus, and Cappadocia. After a slow decline, the city was favoured by several imperial initiatives under Hadrian (117 - 138). It was granted the title of metropolis and as a result of this an ambitious building programme was carried out: massive temples, a stadium, a theatre, a huge forum and an amphitheatre were constructed. In addition, at the city limits the shrine to Asclepius (the god of healing) was expanded into a lavish spa. The Sanctuary of Asclepius grew in fame and was considered one of the most famous therapeutic and healing centers of the Roman world. Galen, after Hippocrates the most famous physician of antiquity, was born at Pergamon and received his early training at the Asclepeion. Pergamon reached the height of its greatness under Roman Imperial rule and was home to about 200,000 inhabitants. The Library of Pergamon was renowned, and second only to the Library of Alexandria, although not approaching Alexandria in scholarship. The city was an early seat of Christianity and was granted a bishopric by the second century. 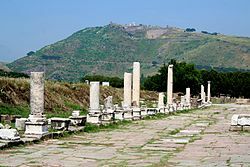 Pergamon is mentioned in the Book of Revelation, as a dwelling place of Satan and a location of his throne, and that an early bishop named Antipas was martyred there. The city suffered badly during the third century and was badly damaged by an earthquake in 262 and was sacked by the Goths shortly after. 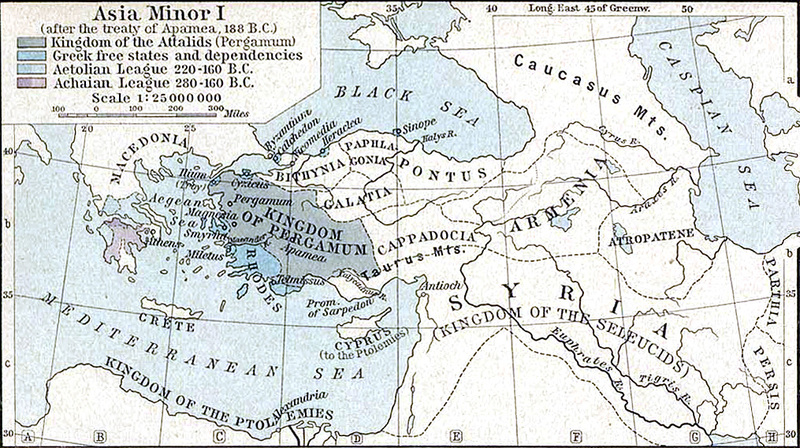 Anatolia was invaded by the Persian Sassanid Empire in c.620 and after the Persians were driven out by Byzantine forces, Pergamon was rebuilt on a much smaller scale by Emperor Constans II. Pergamon was sacked by the armies of Maslama ibn Abd al-Malik on their way to the siege of Constantinople in 717. With the defeat of the Byzantine army at the Battle of Manzikert, the Seljuk Turks were effectively in control of all of Anatolia, but they withdrew to central and eastern Anatolia to consolidate their gains as the Sultanate of Rum and Pergamon returned to Byzantine control. The decline of the Sultanate of Rum in the late 12th century saw the rise of the Anatolian beyliks and with the continuing weakness in the Byzantine Empire, and the expansion of the beyliks, Pergamon was absorbed into the baylik of Karasids/Karası by 1336. Competition among the bayliks resulted in the takeover of the baylik of Karasids/Karası by the Ottoman Emirate - the forerunner of the Ottoman Empire - in 1357. The Ottoman Sultan Murad III had two large alabaster urns transported from the ruins of Pergamon and placed on two sides of the nave in the Hagia Sophia in Istanbul. 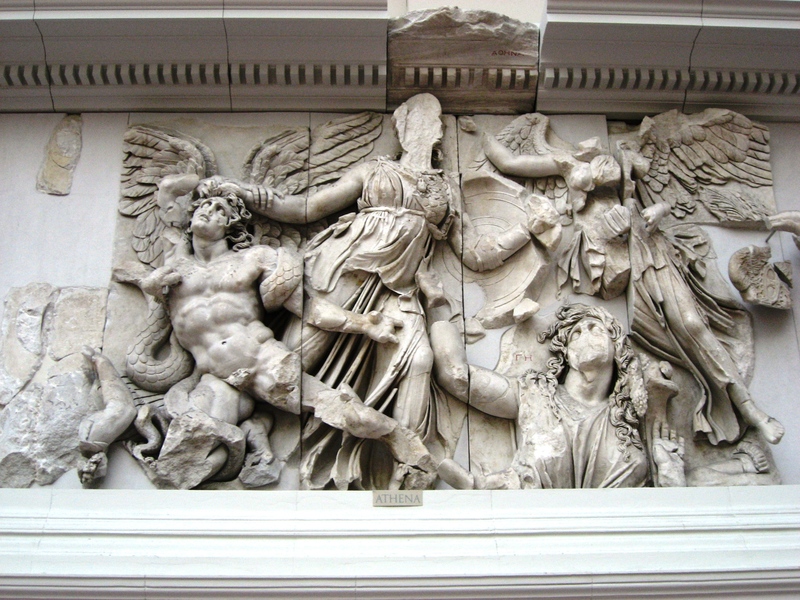 The Great Altar of Pergamon is in the Pergamon Museum, Berlin. The base of this altar remains on the upper part of the Acropolis. It was perhaps this altar, believed to be dedicated to Zeus, that John of Patmos referred to as "Satan's Throne" in his Book of Revelation (Revelation 2:13). A smaller frieze on a wall inside the Altar of Pergamon depicted the life of Telephus, son ofHeracles and legendary founder of Pergamon. The Hellenistic Theater with a seating capacity of 10,000. This had the steepest seating of any known theater in the ancient world. 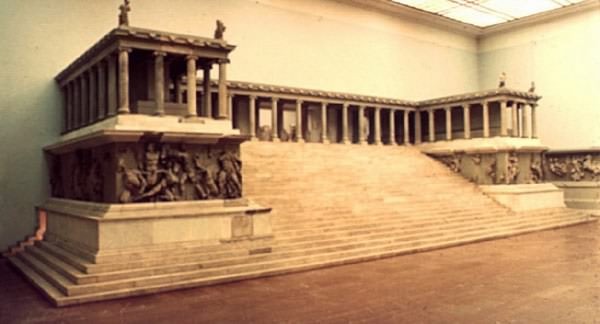 The Heroön – a shrine where the kings of Pergamon, particularly Attalus I and Eumenes II, were worshipped. 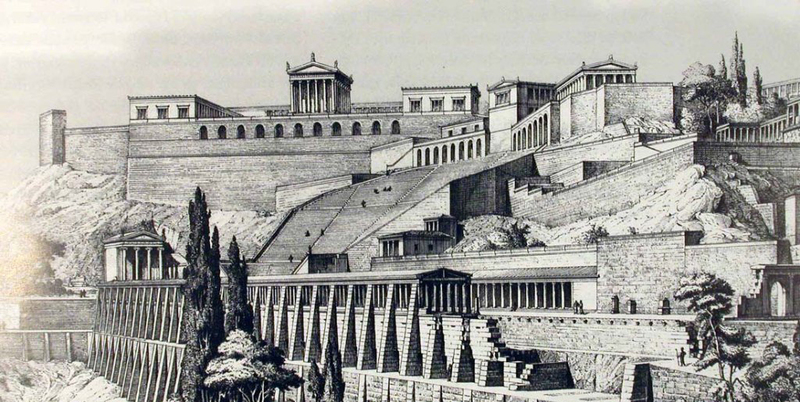 Pergamon's library on the Acropolis (the ancient Library of Pergamum) was the second best in the ancient Greek civilization. Pergamon was also a flourishing center for the production of parchment, which had been used in Asia minor long before the rise of the city. The story about the Pergamene invention of parchment because of Alexandria's papyrus monopoly is a mere legend. The library at Pergamom was believed to contain 200,000 volumes, which Mark Antony later gave to Cleopatra as a wedding present. The site is today easily accessible by the Bergama Acropolis Gondola from the base station in northeastern Bergama. Pergamon's other notable structure is the great temple of the Egyptian gods Isis and/or Serapis, known today as the "Red Basilica" (or Kızıl Avlu in Turkish), about one kilometer south of the Acropolis at (39 7' 19" N, 27 11' 1" E). It consists of a main building and two round towers within an enormous temenos or sacred area. The temple towers flanking the main building had courtyards with pools used for ablutions at each end, flanked by stoas on three sides. At this temple in the year 92 Saint Antipas, the first bishop of Pergamum ordained by John the Apostle, was a victim of an early clash between Serapis worshipers and Christians. An angry mob is said to have burned Saint Antipas alive inside a Brazen Bull incense burner, which represented the bull god Apis. In the 1st century AD, the Christian Church at Pergamon inside the main building of the Red Basilica was one of the Seven Churches to which the Book of Revelation was addressed. Revelation 2:12. The forecourt is still supported by the 193 m wide Pergamon Bridge, the largest bridge substruction of antiquity. Greek inscriptions discovered at Pergamon include the rules of the town clerks, the so-called Astynomoi inscription, which has added to understanding of Greek municipal laws and regulations, including how roads were kept in repair, regulations regarding the public and private water supply and lavatories. ^ Jump up to:a b One or more of the preceding sentences incorporates text from a publication now in the public domain: Herbermann, Charles, ed. (1913). "Pergamus". Catholic Encyclopedia. Robert Appleton Company. Jump up^ Xenophon, Anabasis 7.8.8; Hellenica 3.1.6. Jump up^ Errington, R. Malcolm (2008). A History of the Hellenistic World: 323–30 BC. Blackwell History of the Ancient World 13. Oxford: Blackwell Publishing. ISBN 9781444359596. Jump up^ Tucker, pp. 28–29. Jump up^ Green, Peter. Alexander to Actium. The historical evolution of the Hellenistic age, p. 168. Jump up^ Kekeç 1989, p. 40. Jump up^ Tucker, p. 36. Jump up^ Tucker, p. 34. Jump up^ Klaffenbach, G. (1954). "Die Astynomeninschrift von Pergamon". Deutsche Akademie der Wissenschaften. Abhandlungen. Klasse für Sprachen, Literatur und Kunst. 6. Grewe, Klaus; Özis, Ünal (1994). "Die antiken Flußüberbauungen von Pergamon und Nysa (Türkei)". Antike Welt (in German) 25 (4): 348–352. Xenophon. Xenophon in Seven Volumes, Carleton L. Brownson. Harvard University Press, Cambridge, MA; William Heinemann, Ltd., London. vol. 1. 1918, vol. 2. 1921, vol 3. 1922. DANIEL 11:51 "His armed forces will rise up to desecrate the temple fortress and will abolish the daily sacrifice. then they will set up the abomination that causes the desolation. JC: JONATHON CAHN It's going to be repeated in the Last Days. Zeus facts, information and stories from ancient Greek mythology. 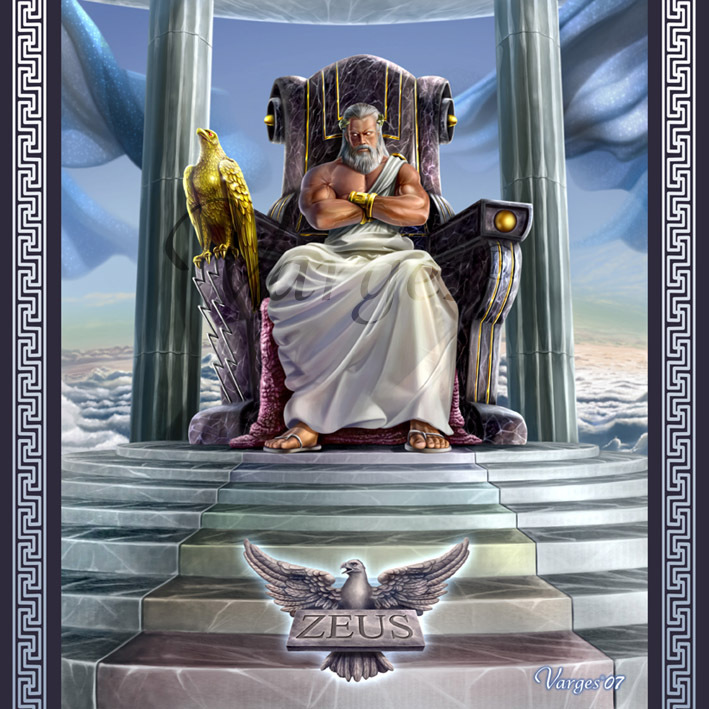 Learn about the Greekgod of the sky and king of the gods, Zeus. JC: Daniel set up an altar of Zeus in the Temple of God. This was done to start a war with the Jews. By a miracle, the Maccabees rose up, they got to the Temple, they win and restore the Temple, take down the idol of Zeus and restore Hannakuh. JC: Another type of Antichrist, at the same time sets up another altar of Zeus on a mountain and it's called Pergamon's Altar of Zeus. JC: This is one of the biggest pagan things of ancient times. Rev. 2:13 "I know where you live - where Satan's has his throne." Christianity comes to the Roman Empire. The Altar of Zeus is abandoned and dwindles down into dust. But fast forward to the 19th century. A man comes who uncovers this throne of Satan. He starts sending pieces back to his homeland. JC: He doesn't really know what it is but in 1871, he sends the first pieces home. Then they start excavating the entire throne and altar and Satan is now appearing in the modern age and is reconstructed in the Pergamon Museum in Berlin, Germany. JC: Germany now has the throne of Satan. At the same moment in 1871, where the throne of Satan is reconstructed, Germany now comes into existence. JC: In 1878, they begin excavating the entire altar. In 1878, anti-semitism begins in Germany. They finally complete the Throne of Satan in 1882 in Berlin, Germany. In that same year, a man was born by the name of Adolf Hitler. Get more on the rise of Fascism in Europe and the life of Adolf Hitler, one of history's most notorious dictators, at Biography.com. JC: Now what happens is that the destruction of the world is going to be centered in Berlin, Germany where the altar of Satan is. There is a day in the Hebrew calendar when there was the first attempt to annihilate the Jewish people. JC: They chased after the Israelites to wipe them out of the Red Sea. Nissan 19 is the date of Adolf Hitler's birth, the same day that Pharoah attempts to destroy the Jews. Then we had WWI, and after all the reconstruction of WWI, the Altar of Satan is still there, the next evil comes to Germany. The Nazis began to rise. It's a drama to watch the Nazis to move to Berlin where The Altar of Satan is. 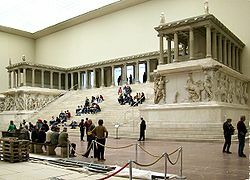 In 1930, tht Pergamon Museum opened to the public in Berlin, Germany. In 1930, the Nazis went from beomg the smallest political party to the second largest. It went to number two and they won the election and moved to Reichstag. 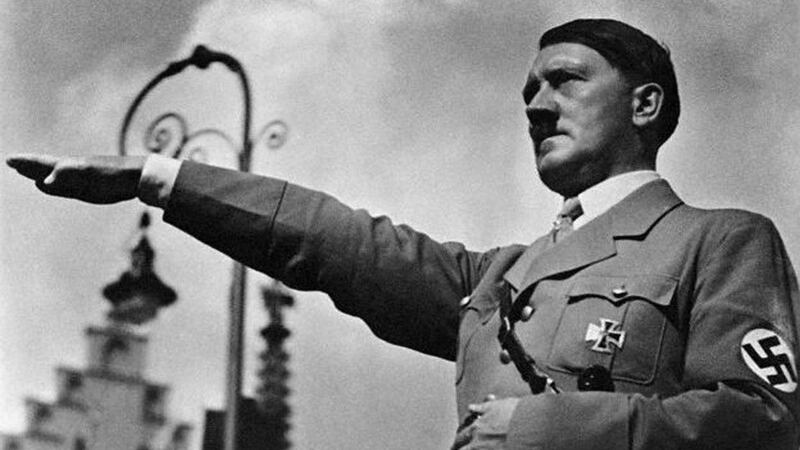 They started gaining power and within three years Adolf Hitler became chancellor of Germany. Within four years he became dictator. Now the baby Adolf is with the altar of Satan in Berlin. So the Nazis have possession of the throne of Satan. It's almost like an Indiana Jones movie but this is real. This is real! So now its like --- all of Germany is possessed. The entire nation is going to become possesses. So, one of the first things Adolf says is that "I want a platform from which I can speak to Germany and the world. He appoints his architect Albert Speer to build him a platform so he can spew his venom. albert Spear just happened to have visited the Altar of Pergamon, so ge gets the idea to recreate the Altar of Pergamon - the Altar of satan. So, when you see Hitler speaking, when you see hom speaking at those massive rallies, he is at Nuremburg. he says "so much sacrifice, and many privations. It would be an outrage if we were to lose. So, when he is speaking and railing, he is on the recreation of the throne of Satan. And what is the enemies goal? The goal is to wipe out the Jewish people. Just like he tried to put the altar of Zeus on the Temple Mount which is a foreshadow of the Last Days. Rhea hid Zeus in a cave on Mount Ida in Crete. ..... or Zeus Aenesius, he was worshiped in the island of Cephalonia, where he had a temple on Mount Aenos. So now what happens? On a throne a King speaks, so on this throne, the enemy speaks to Hitler. On a throne, the King rules, so on this throne, the rule become law. At the same time, in that same city, while Hitler is on that podium, they come up with the Nuremburg laws. The Nuremburg laws are the beginning of the Holocaust. It was at that time, for the first time Hitler uses the words 'final solution' That happens on the altar of Satan. The throne of Satan is also an altar. What is an altar? An altar requires blood. A table or flat-topped block and the focus for a religeous ritual, especially for making sacrifice or offering to a diety. A holocaust is not just a death oe sacrifice, this altar was the throne of Zues, it was an altar of burnt offerings. The altar of Pergamon involved burning and ashes and so this how evil Satan is. Books and writings deemed "un-German" are burned at the Opernplatz. Berlin, Germany, May 10, 1933. "Book burning" refers to the ritual destruction by fire of books or other written materials. 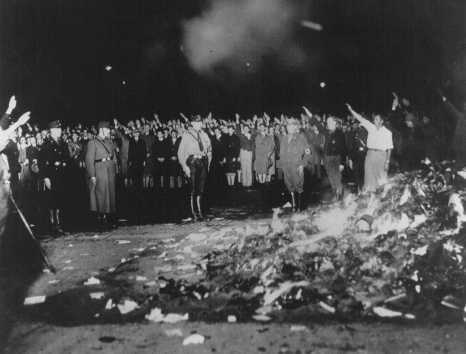 Usually carried out in a public context, the burning of books represents an element of censorship and usually proceeds from a cultural, religious, or political opposition to the materials in question. 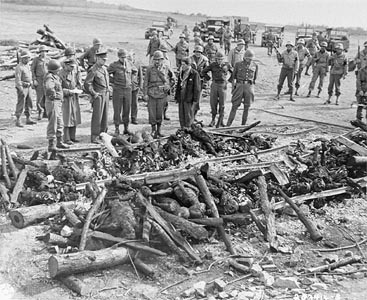 Book burning has a long and dark history; and perhaps the most famous of these events, the burning of books under the Nazi regime on May 10, 1933, had a precedent in nineteenth century Germany. In 1817, German student associations (Burschenschaften) chose the 300th anniversary of Luther’s 95 Theses to hold a festival at the Wartburg, a castle in Thuringia where Luther had sought sanctuary after his excommunication. The students, demonstrating for a unified country—Germany was then a patchwork of states—burned anti-national and reactionary texts and literature which the students viewed as "Un-German". On April 6, 1933, the Nazi German Student Association's Main Office for Press and Propaganda proclaimed a nationwide “Action against the Un-German Spirit,” to climax in a literary purge or “cleansing” (Säuberung) by fire. Local chapters were to supply the press with releases and commissioned articles, offer blacklists of “un-German” authors, sponsor well-known Nazi figures to speak at public gatherings, and negotiate for radio broadcast time. On April 8 the students’ association also drafted its twelve "theses"—a deliberate evocation of Martin Luther’s 95 Theses: declarations which described the fundamentals of a "pure" national language and culture. Placards publicized the theses, which attacked “Jewish intellectualism,” asserted the need to “purify” the German language and literature, and demanded that universities be centers of German nationalism. The students described the “action” as a response to a worldwide Jewish “smear campaign” against Germany and an affirmation of traditional German values. Among the authors whose books student leaders burned that night numbered well-known socialists such as Bertolt Brecht and August Bebel; the founder of the concept of communism, Karl Marx; critical “bourgeois” writers like the Austrian playwright Arthur Schnitzler, and “corrupting foreign influences,” among them American author Ernest Hemingway. The fires also consumed several writings of the 1929 Nobel Prize-winning German author Thomas Mann, whose support of the Weimar Republic and critique of fascism raised Nazi ire, and the works of international best-selling author Erich Maria Remarque, whose unflinching description of war, All Quiet on the Western Front, Nazi ideologues vilified as "a literary betrayal of the soldiers of the World War." Erich Kästner, Heinrich Mann, and Ernst Gläser, denigrated in Goebbels’ blistering rhetoric, represented early German literary critics of the Nazi regime, although Heinrich Mann had gained fame as the author of Professor Unrat, which appeared in German cinemas in 1930 as “The Blue Angel”; and Kästner was primarily known for his literature for children and young adults. Other writers included on the blacklists were American authors Jack London, Theodore Dreiser, and HelenKeller, whose belief in social justice encouraged her to champion the disabled, pacifism, improved conditions for industrial workers, and women's voting rights. Not all book burnings took place on May 10, as the German Student Association had planned. Some were postponed a few days because of rain. Others, based on local chapter preference, took place on June 21, the summer solstice, a traditional date for bonfire celebrations in Germany. Nonetheless, in 34 university towns across Germany the May 10th “Action against the Un-German Spirit” was a success, eliciting widespread newspaper coverage. In some cities, notably Berlin, radio broadcasts brought the speeches, songs, and ceremonial chants “live” to countless German listeners. The promotion of "Aryan" culture and the suppression of other forms of artistic production was yet another Nazi effort to "purify" Germany. Naturally Jewish authors numbered among the writers whose works were burned, among them some of the most famous contemporary writers of the day, such as Franz Werfel, Max Brod, and Stefan Zweig. Also among those works burned were the writings of beloved nineteenth-century German Jewish poet Heinrich Heine, who wrote in his 1820-1821 play Almansor the famous admonition, “Dort, wo man Bücher verbrennt, verbrennt man am Ende auch Menschen": "Where they burn books, they will also ultimately burn people." It is often asked why Jews did not make greater attempts at resistance. Principally they had no access to arms and were surrounded by native anti-Semitic populations who collaborated with the Nazis or condoned the elimination of the Jews. 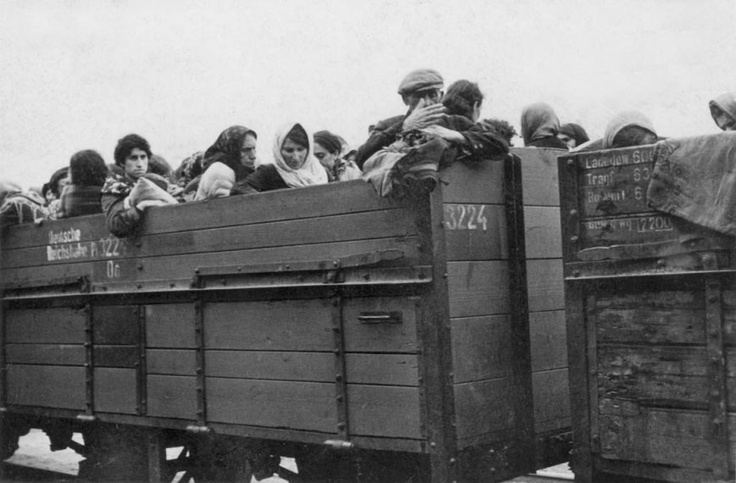 In essence the Jews stood alone against a German war machine zealously determined to carry out the “final solution.” Moreover, the Nazis went to great lengths to disguise their ultimate plans. Because of the German policy of collective reprisal, Jews in the ghettos often hesitated to resist. This changed when the Germans ordered the final liquidation of the ghettos, and residents recognized the imminence of their death. JC: WHAT DOES THE ENEMY DO? IT DESECRATES AND DEFILES! Back in ancient times, it wasn't just abomination of desolation, it was converting God's Holy Temple, the altar of sacrifice to an Un-Holy altar. So what the enemy does when he tries to destroy the Jewish people, because he knows if he can't destroy them, he loses, so he takes the Holy things that God gave them - they were saved by the sacrifices on that altar in Jerusalem. On the altar of sacrifice, they were saved on Yom Kippur - It was a Holy thing. So, what does, he takes a Holy thing and turns it into an Unholy thing to destroy the Jewish people. Three separate piles of wood burned atop the altar. The largest of these was where all the portions of the sacrifices were burned; the second fire provided the coals for the Altar of Incense within the sanctuary, and the third was the "perpetual fire" which constantly burned on the altar. Nothing was placed on it, and no coals were taken from it. It existed solely to fulfill the commandment that there be a perpetual fire, as the Torah states: "And a fire shall burn there on the altar constantly; it shall not be extinguished" (Leviticus 6:12-13). There was no commandment regarding the type of wood to be used; however, the Rabbis forbade the use of olive wood and grape vine, as these would not burn well and needed to be conserved because of their commercial value to the people. Three particular types of wood were preferred: fig, walnut, and pine. These woods all burn well, and were therefore preferable. The choicest branches of fig were used for the second fire, the one from which coals were taken for the Altar of Incense. If all of the lamps of the menorah went out, they would have to be rekindled from the fire on the Altar of Burnt Offering. A large pile of ashes was formed in the center of the altar from the remnants of the three fires. 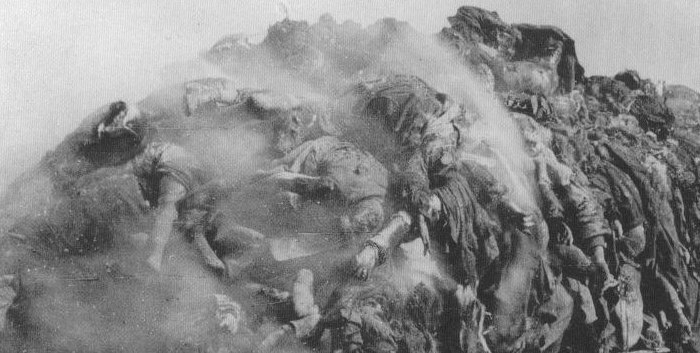 A portion of the ashes from this pile were required to be removed every morning before the first sacrifice of the day. In the Second Temple, the priest who fulfilled this mitzvah (commandment) was chosen by lottery every morning. He would vest in his priestly vestments and wash his hands before approaching the altar. The ashes were taken up in a silver shovel and set on the ground to the east of the altar at what was called, "the place of the ashes." Then he would change from his priestly vetments into ordinary clothing and remove the ashes to a clean place outside the camp (Leviticus 6:10-11, Cf., 1:16). In Exodus 27:3 the various utensils used with the altar are enumerated. They were made of brass. (Comp. 1 Samuel 2:13-14; Leviticus 16:12; Numbers 16:6-7). The altar could not be carved using utensils made of iron or of bronze (Exodus 20:25), nor were any allowed on or near it, because iron and bronze were used for implements of war. The Altar and its utensils were considered to be sacred, and the priests had to vest and wash their hands before touching them—even so much as removing the ashes from the altar. According to the Bible, the fire on the altar was lit directly by the hand of God and was not permitted to go out (Leviticus 6:12-13). No strange fire could be placed upon the altar. The burnt offerings would remain on the altar throughout the night before they could be removed (Leviticus 6:9). A second lottery would be made to determine which priests would fulfill the various duties involved in offering the sacrifice and preparing the menorah and the Golden Altar. JC: Yom Kippur involves the scapegoat. You put your sins on the scapegoat. Scapegoat derives from the common English translation of the Hebrew term azazel (Hebrew: עזאזל) which occurs in Leviticus 16:8 after the prefix la- (Hebrew לַ "for"). And Aaron shall place lots upon the two he goats: one lot "For the Lord," and the other lot, "For Azazel. (for absolute removal)"
JC: What did Hitler do in Germany to the Jewish people? That's from Yom Kippur. That is something Holy. They put their sins on the Jewish people! Another thing, on Yom Kippur, it was marked by the color red, they put a scarlet cord on it. When the Germans started the holocaust, they changed all the passports and on the Jewish ones, they put a letter J in red. Then what do they do with the sacrifice on the Holy sacrifice. The sacrifice would be led to the place of sacrifice. What happened to the Jewish people? They were led like lambs to the slaughter of sacrifice. What were they led in? Cattle cars! The Jews were led to the sacrifice in the cattle cars like cattle, lambs and goats, the way sacrifice that was offered up on Yom Kippur! What did the Greeks call that Altar of Zeus? In Greek the word is Caudos which means burnt! A complete burnt offering was called Holos which means 'whole, complete! So, instead of calling it Holos cautaus, they called it "Holocaust". It was the altar of Holocaust! The throne of Satan, the throne of Zeus was called the altar of Haulocaust. They were standing on top of a recreation of Satan's throne already was called the altar of holocaust there. On the Altar of Zeus, where is lifted up holocaust in ancient times, these offerings were done at night and hissen away, as the holocaust was hidden as it was being done. but in the Septuagint, the verse says in the Greek, offer the second for a holocaust. Leviticus 4:29 He shall slay the sin offering in the place of the Holocaust. JC: It looks like the enemy is taking Holy things meant for salvation and turning them for evil against it. 2 Chronicles 29:7 They did not offer burnt offerings in the Holy place. JC: There is a place in Europe called The Holy Place. Os wiecem in Germany which means The Holy Place. In German that same word means Auschwitz. Auchwitz means The Holy Place. The enemy was behind it all. The enemy is real. And not only the holocaust because that wasn't the only destruction, but linked to the holocaust is the greatest destruction that ever covered theearth so far. And that was the Second World War. The two happened together. He attacked the Jews first - also the Greek, then calamity comes to the Jews first. The enemy knows if he can attack the Jews, he can attack the world. If he can get the Jews out of the way, he's gor the world. So that's why we always have to bless Israel. Who was offered up first? The Jewish people! Then the people of all nations. How many were killed in WWII? Over 60 million people. Adolf Hitler ordered the slaughter of around 6 million Jewish people. They were the tithe. The tenth! The fruit! The first fruits! And what does it sayin the Bible? It actually says that the Jewish people are the first fruits of God for salvation, for blessings, but now the enemy turns it on it's head. In the end, Hitler brings his own destruction. When you serve the enemy, you bring your own destruction. Hitler killed himself by gunshot on April 30, 1945. He had given orders that his body be burned and became thr last burnt offering. April 30th is Walpurger Night which is "witches Night". It is one of the most Satanic nights of the year. It is the night they offer sacrifices. It is the only Satanic sacrifice. As the global cataclysm nears it's end the armies of America and it's allies converge with the armies of the Soviet Union and they all converge on the city of Satan, they all converge on Berlin, Germany. The calamity started in Berlin and now all comes back to Berlin where the Altar of Satan is located. WAR TIME PROPAGANDA - DON'T BELIEVE IT!!! ... and all of a sudden my Father goes and throws himself down on a bench and I went over to see what was the matter and he started saying, "Ever since WWII . Nicaragua, a country under attack by the regional superpower, did on October 15 , 1985, what we did in Hawaii during World War II: instituted a state of siege. This was the worst mass murder in Europe since WWII. Queen Beatrix, the Bilderburger leader, witnessed the mass sacrifice as part of a ritual ceremony. Mar 2, 2002 ... Hiroshima Day, 6th day of Aug, WWII A-Bomb used 1945. 9. 9. 9. Nagasaki Bombed, 9th day of Aug, WWII A-Bomb used 1945. 14. 14. 14. Feb 8, 2012 ... ... System in Asia after World War II, and a class on the basics of bel canto singing , including teaching the group two Classical vocal canons. JC: Now everything is destroyed. They have new judgment which comes back to Third Reich in Berlkib and Nuremburg where the original Altar of Satan is and where that massive replication of it is - The Altar of Hitler. Those who were convicted - The Nuremburg 10 - who were hung. They were hung on a Hebrew Holy Day. It's a day marked for judgment. Contains documents regarding the Nuremberg War Crimes trial. JC: it was said that in the early days, Hitler went to a psychic medium and he asked her "When am I going to die?" and she said, "You are going to die on a Hebrew Holy Day!" He said, "That's crazy! How do you know that?" She said," Any day you die is going to be a Hebrew Holy Day!" Adolf Hitler killed himself by gunshot on 30 April 1945 in his Führerbunker in Berlin. His wife Eva (née Braun) committed suicide with him by taking cyanide. Apr 30, 2015 ... It wasn't immediately clear what had happened on April 30, 1945. This much the world knew: Adolf Hitler was gone, one way or another. JC: But God caused it to happen that way. But here now, let's bring it home! This mystery has come to America. The whole world is going to lead to the End Times. JC: Why has the enemy warred against the Altar of God since the beginning? From the first abomination of desolation to the Antichrist, he will. Why? Because the Altar of God, the alttar of the last offering was the sign, the shadow of the cross of the Messiah. He is so against it, because that was the foreshadow of the cross of Messiah! The offering of Messiah is the defeat of the enemy. He hates the cross. But it takes everything and tries to twist it. The first foreshadow of that Altar is in Genesis 22. John 1:29 Behold the Lamb of God, which taketh away the sins of the world. JC: They've been vulnerable. They've been vulnerable to everything the enemy has done. They've been like sheep without a shepherd. Ezekiel 34:5 So they were scattered because there was no shepherd and when they were scattered, they became food for all the wild animals. JC: Either the Messiah takes your hell or you bear it. For 2,000 years, the enemy has been fuurious to destroy them. NOTE: While I'm typing this, Aljazeera news is showing scenes from religeous wars in Kosovo and Nigeria, where thousands of men and boys were systematically butchered and the United States was forced to go over in airplanes and bomb the enemy because they wouldn't stop slaughtering people for being a different religion. JC: The Bible likens the enemy to a wolf among the lambs. The Jewish people had no lamb. The people are spoken of as sheep without a shepherd. John 10:12 The hired hand is not the shepherd and does not own the sheep. So when he sees the wolf coming, he abandons the sheep and runs away. Then the wolf attacks the flock and scatters it. JC: ADOLF - the day he was born - means "the wolf" Adolf, from the German name Aodolwolf which means 'noble wolf'. This just reveals such a little bit - there is so much. It shows how real the enemy is. He's real! JB. (BAKKER) This is so scary. We need to wake up because ... America - I'm scared to say this ... It is happening. I'm scared we are going to start taking the crosses out of the National cemeteries. But the cross is so hated in our country. Even in the army, they are taking the crosses off the tents for the Chaplains. In some places, you can't even use the Bible, because it offends the Arab world. On 9/11, the only sign of protection remaining was the dross. And the cross still stands. Every sin, every temptation is a war from the enemy against your soul. Treat it as prison. Every sin, every temptation - don't play with it because it is there to destroy you. The other thing is, in that it tells you how important the cross is. Don't get into a doctrine war, this doctrine, or that doctrine, your own prosperity. It's the cross! It's the cross! The enemy hates it because it is so powerful. The blood of Jesus is stronger than the enemy, than the world of flesh - the Devil. We must stay with it and that's the power of it. You can't play with the cross. That is our bridge to Salvation. JC: We have to stay with the cross. The enemy launched his war against the Jewish people and has tried for 4,000 years. He's used Egypt, Assyria, Babylon, Rome, Hitler, and all these things, but the ultimate story is that Egypt is gone, Assyria is gone, Hitler is gone, the terrorists will be gone, but the Nation of Israel lives because the God of Israel lives, because the Messiah still lives. Our God is stronger and we win in the end. If we stay with God, we will win as well. Aug 8, 2014 ... BAKKER I quake and shake when I hear the word. ...... Jim Bakker thinks it will be a huge earthquake in the Los Angeles area, but we can only .